Look for the Proudly Wisconsin Badge when shopping for cheese. Any brand of Wisconsin Aged Cheddar can be used in this recipe. 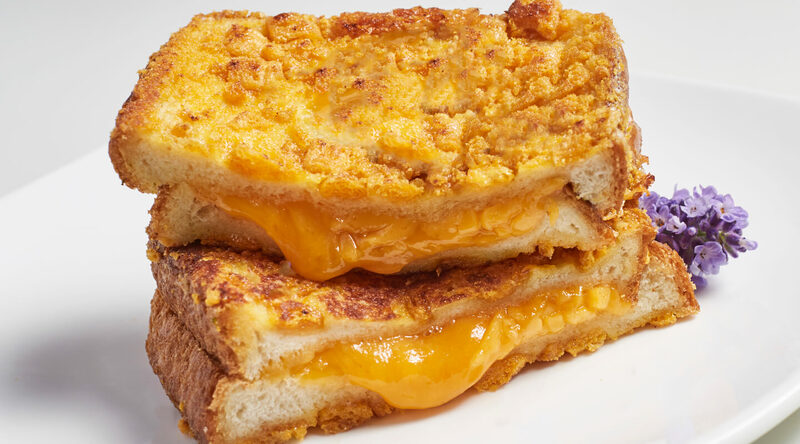 Layer two Texas toast slices with cheddar; top with remaining toast slices. Whisk eggs and milk in a shallow, large bowl. Place cereal in another shallow, large bowl. Dip one sandwich into egg mixture, coating both sides. Then dip both sides of sandwich into cereal, patting to help coating adhere. Melt 1 tablespoon butter in a large skillet over medium-low heat. Toast one sandwich for 2-4 minutes on each side or until bread is golden brown and cheese is melted. Repeat with remaining sandwich. Brunkow 2 Year Aged Cheddar cheese is smooth and creamy with a nutty flavor. The tangy, sharp cheese flavor is an ideal match for the sweetness of the cereal in this recipe. It’s also a great table cheese; try it with crackers, apple slices and your favorite red wine.